For about a year now, there's been this bookshelf in the corner of my home office. A hand-me-down made from particle board, it didn't match our style and served no real purpose except to collect all the items we were going to sell at our future yard sale. A box of various literary magazines. A pair of rubber flippers I got for free at work. The juicer we never use. Random office supplies purchased in a fit of organization. As the shelves filled I began to grow impatient. Did we have enough stuff yet? Was it time to plan the yard sale? Could I finally get rid of this damn bookshelf once and for all? As it turned out, we didn't have quite enough stuff to warrant a yard sale. What we did have, however, was even better: like-minded friends. And thus our multi-family yard sale was born. We held it this past weekend, made some cash, and learned a number of lessons along the way. The result? 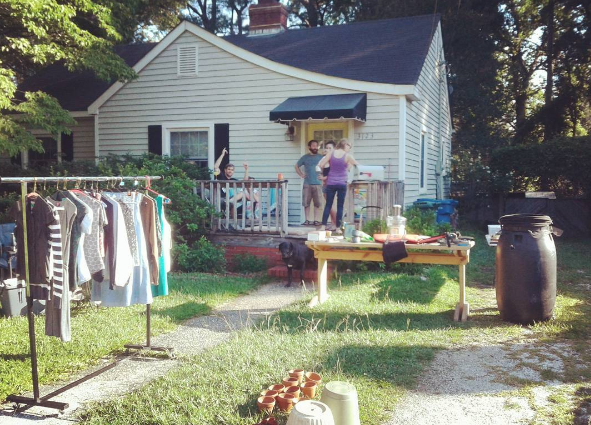 This blog post, featuring my best tips for hosting a multi-family yard sale. 1. Sell the really good stuff on Craigslist. The yard sale crowd is notoriously cheap and on the prowl for major deals. If you have expensive items that would appeal to a niche audience, Craigslist is a better bet. Over the last few weeks, we'd been listing and selling some things for a decent profit. This included: two rain barrels made by Nathan, some extra beer brewing supplies, a surfboard, and a pile of old windows (don't ask). Sure, those big items could have helped draw people to our yard sale, but in all likelihood someone would've offer us $5 for that old surfboard, whereas we easily get $40 on Craigslist. The math checks out. 2. Speaking of Craigslist, post your sale there. 3. Price your items the night before the sale. 3. Be ready an hour before your yard sale actually starts. Our yard sale started at 7AM, and at 6:15 cars were already parked on our street, watching as we stumbled out our front door with arms full of items. As soon as we began arranging them on tables, people walked up our driveway, asking about this and that. I wanted to say, "We're still setting up and I haven't even had my first cup of coffee yet." Instead I said, "That dress is a size 6, I'm not sure on price, I hadn't really thought about it - uh, five dollars?" I'm sure I undersold some things because I was caught off guard, and I'm sure those yard sale pros who showed up 45 minutes early knew exactly what they were doing. Also by the time our friends arrived to set up their stuff, we'd already made a cool $50, so I would also suggest letting your friends drop off everything they plan to sell the night before, and maybe even invite them to camp out in your front yard so they don't miss any early birds. Those people do not mess around. 4. Make sure each family has enough small bills to make change. We had four families in our yard sale, including us, and we were all prepared with our own cash registers with plenty of change. No one had to borrow from anyone else, which was my biggest fear. Can you imagine trying to keep track of what you're selling, what you're making, and what you own your BFFs? Me neither. I'm glad I didn't have to. 5. 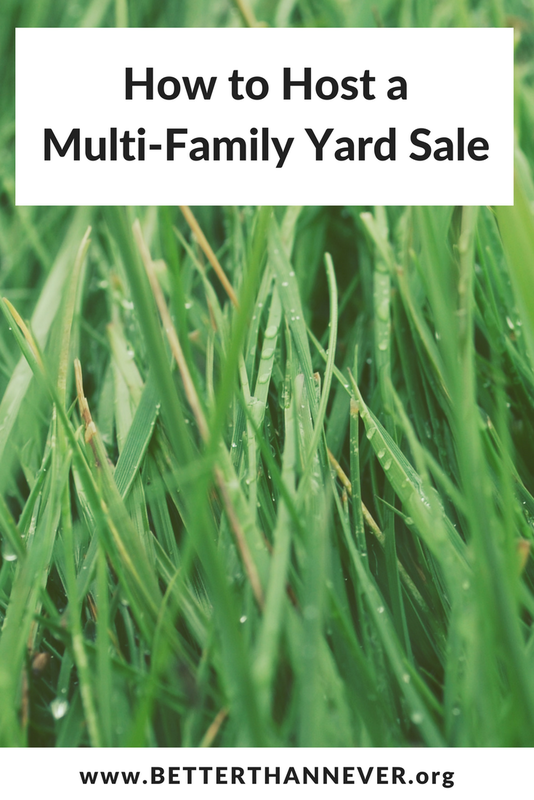 Give each family their own area of the yard. My front yard is not huge, but it does have a shady dogwood tree and a long driveway. The night before, we moved our cars to some open spaces around the block and staked out four separate areas in our yard. So, while there were multiple piles of books and clothes and VHS tapes, it was easy to tell who was selling what - and easy for our customers to figure out who they should pay. 6. Make a big pot of coffee and lots of mimosas. 7. It helps to have a cute baby on hand. My friend Kat brought her six month old baby along for the adventure, and I'm pretty sure his chubby cheeks and leg rolls made more sales than all my wheeling and dealing combined. Many people asked how much the baby cost, and our answers varied from "Free to a good home" to "Four thousand eight hundred and thirty-three dollars and sixty-seven cents." (See: mimosas and no breakfast.) At one point, a woman bought a book from Kat for $1.00 and I said, "Thank you, you're putting food on this baby's table," and then she gave Kat an extra dollar! Sometimes having a baby really pays. Not counting our Craigslist sales in the weeks leading up to the yard sale, we ended up making $170 over the course of a single Saturday morning. We also brewed two pots of coffee, drank three bottles of champagne, forgot to eat breakfast, got rid of some things we weren't using and didn't need, and spent time with our friends in the shade of the dogwood tree. Overall, we had a successful multi-family yard sale and I sincerely hope we never have enough extra stuff to warrant another one.